Turning 50…know the feeling? In this case the birthday girl…or book as in this case…is a little number called The Outsiders by S.E.Hinton. Yes, The Outsiders is turning 50 this year. 50 years old. So let’s do the math…2016 minus 50 means she wrote the book in 1966. There weren’t many YA books on the shelves back then. 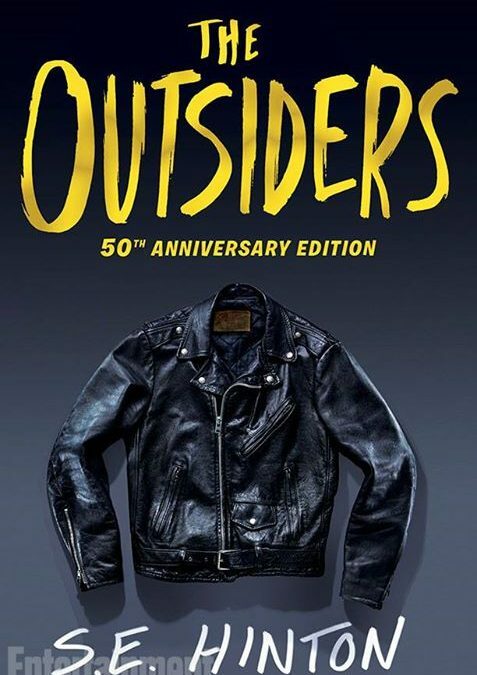 In fact, The Outsiders is often cited as being the first Young Adult book….though many scholars will reach back into the 18th century and conjure up a precursor. I had the rare privilege of hearing S.E. Hinton speak a few weeks ago at the NCTE (National Council of Teachers of English) Conference in Atlanta, GA. It was one of those times when you walk into the room and you can’t believe that sitting across the sea of tables and about to step up to the podium is someone so iconic that you realize you are in a rare space with an amazing human being and you want to hear every word and get every speck of energy from this very special human being. She was 16 when we wrote the book. She had been writing for 8 years using the works of Jane Austen as her writing instructor. 1. She loved to write. 2. She wanted to read a book like this. There weren’t any books like this on her library’s shelves. 3. She was mad about the social situation in her high school. There was nothing in the female culture for her to identify with. She wanted her own car not to ride in some guy’s car. She wanted to be a horse not own a horse. In her junior year of high school she flunked…yes…she flunked creative writing. Sigh…..
She talked to us about writing and told us she discovered that when you develop a character whether it’s a band or a best friend, you will run them through your own mind, through your own filter so that every character is part you. She told us when she gets letters from readers saying, “You changed my life,” she believes it is the message that has reached them not the messenger. She submitted the manuscript. She was 16. That’s a pretty simple sentence but think about the courage it took to do that. There was no well-traveled path for her to follow. There weren’t YA books lining shelves in libraries across the country. But she didn’t like how the greasers were looked down upon and how the kids in her high school separated themselves into groups. So, she did a powerful thing. She wrote about accepting people as individuals and taking time to understand their story. She wrote about not labeling people. She wrote to tell the truth she saw in her high school. 50 years later middle schoolers and high schoolers still read the book. It’s still relevant. And because of the movie that was made, S.E. Hinton’s closest friends now include Frances Ford Coppola and some of the guys from the cast. Talk about a willingness to risk. Talk about knocking down walls and inviting everyone to belong. Thank you NCTE and thank you to the folks at Penguin who created this very special morning.